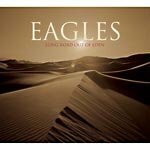 Dr. Rock's Blog & Roll: Album of the Day: Eagles (10/30/07) 2nd Birthday! Album of the Day: Eagles (10/30/07) 2nd Birthday! The Eagles were the quintessential 70’s soft-country-rock band, an amalgam of the pure country-rock of Poco and the harmonies and jangle guitar-rock of the Byrds with far greater recording production supporting their obvious talents as performers and songwriters (Eagles playlist here). The Eagles defined the 70s L.A. soft pop-rock sound and opened the way for the 80s light MOR country-pop sound that members Don Henley and Glen Frey exploited with multi-platinum albums. In the 70s the Eagles produced five #1 singles, 14 Top 20 hits overall and six #1 albums (including two of the best selling albums of all time, 1975’s Eagles: Their Greatest Hits (1971-1975) and 1976’s Hotel California. By the end of 20th century, the Eagles were still going strong, although mostly as a huge selling retro-band, with an audience leaning toward the “classic rock” sounds of the 70s era the Eagles dominated. The band released sporadic reunion and “live” revival albums until Long Road Out Of Eden, their first album of any kind in 13 years and their first studio release in over 20 years, came out two years ago on October 30, 2007. Long Road Out Of Eden is a throw-back collection of songs that mirror their peak years (and initially available only at Wal-Mart Stores, the colossal global discount retailer). In an age where great rock music is limited, even a retro-album like Long Road Out Of Eden is a relief. It’s on my buy list and recommended for any Eagles fan or lover of 70s soft-rock. Long Road Out Of Eden is now available (not just at Wal-Mart) as download tracks from iTunes (click here) and as a CD from Amazon (click here).